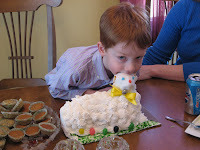 Easter has come and gone and the kids had a ball this year. 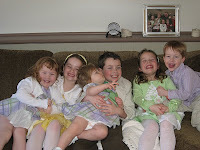 They had a great time decorating eggs and then searching for the baskets/eggs that the silly Easter Bunny hid on them. Below are some pics recapping the festivities. Enjoy!! Well Jacks is all set to get his Tonsils and Adenoids out. We are on the books for May 8th. Our Pediatrician wants this done at Lutheran General Hospital to be safe. And we are fine with that. Jack is not too happy about it but they sent us information to talk to him about so maybe that will help. We are all doing okay. I continue with Physical Therapy from our accident on 3/9/08 and will go to see an Ortho doctor on 4/1/08 at the advisement of our Lawyer. Yes, we have had to hire a lawyer. The man that hit us insurance company is denying liability due to a medical issue the man had. So, we now have to go after them for our losses. We will see how it goes. I am also taking Jack back to the doctor because since the Thursday after the accident he has been complaining about headaches at night. So, we want to get it checked out because he has never had a headache before and it is a little conerning how long it has gone on and when it started. But, other than that we are doing good and are very thankful this Easter that we are all in one piece. I love our new car. As many of you knew I never wanted to drive a mini-van, but I have been pleasantly surprised by our Chrysler Town and Country Limited. The kids (or I mean Jack and Meggan) can get in and out of the car on their own without me having to assist like in the Jeep. :) Ahhh the independence... So we are all enjoying that. Well we wish all of our friends and family a Happy Easter!! Hope the Easter Bunny is good to everyone!! A little history on Jack is that he has been snoring for a couple of years and wakes up very cranky after 11 hours of sleep. Our pediatrician is concerned that he has Sleep Apnea based on what has been going. Plus over the past 2-3 mos. Jack has had 5 ear infection. Not good. So, we went to see our family ENT (I say that because Dr. Miller took out my tonsils and his practice is going to take out my nephew Jimmy's T&A). Anyway, so we will be getting his surgery scheduled first thing tomorrow morning. We will let everyone know when it is going to be. We hope it will get scheduled very quickly before we encounter another ear infection. Anyway, adios T & As!!!!! Happy St. Paddy's day to all the O' and Mc's out there. We had a pretty low key St. Paddy's day this year. Enjoyed some beef stew with the family and then played a little bingo with our little leprechauns. And those leprechauns are pretty tricky. Somehow they were able to turn Jack and Meggan's milk green when we would pour the milk into their cups. It was amazing. But, it only happened to their cups. How can that be????? Well have a wonderful St. Patrick's day to all of you and your family!!! Well we took Ally to get her 1st birthday pictures done and the pictures are just amazing. Click here to see the pictures. The password is Ali. Enjoy!! Well it has been quite a month already with all 3 kids having ear infections and Jack getting ready to go to an ENT to get his Tonsils/Adenoids hopefully removed. And then we have our little sweetheart, Ally, birthday. She definitely got into opening the gifts and eating cake. No questions for her on what she should do. She is now walking and she will even show you her pointer finger if you ask her if she is 1. Then just when we thought things were getting better because the kids were all feeling better we were in a car accident. It happened the day after Ally's birthday. Thankfully we are ok. Jack and I got the worst of it because we were hit on the passenger side by someone running a red light going at least 45mph. I am having some issues with my shoulder and Jack is extremely traumatized by it all. Thankfully Ally was asleep in the car when it happened so she was more startled than anything. And then we have our trooper Meggan who was completely unharmed. We are thanking the Angels that protected us because as you will see from the pictures of our car we are very lucky that we were not more hurt. Hello to all! I know it has been awhile since I have blogged, but it has been a busy few weeks. All 3 kids have had ear infections, so we have had some grumpy personalities. But, we are getting back to normal. Jack went to swim lessons today and it was Open House day so we went to watch. He did an awesome job!! Smiled the whole time while we watched. Ally has been a busy little girl as usual. Takes off crawling when we come near her. Scares me a great deal that she is turning into Meggan. :) And Ally began to really walk last weekend. The look on her face is absolutely fear, so it is quite funny. Ally is cutting another couple teeth. She definitely does not seem to be as slow as Jack and Meggan with getting her teeth. 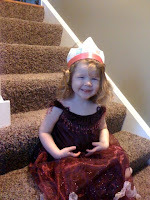 And then we have the princess, Meggan. My sweet darling little Meggan. Meggan has seemed to have started a new tradition at dinner time. She has a trunk full of beautiful dresses from her dear Nama. So, she now puts one on for dinner each night and comes upstairs and says to Jack "Let's go to lunch". As if they are going on a date. It is soo hilarious. Below is a picture of Meggan and what she wore to dinner tonight. And this is no joke. She gets her self all ready on her own. Last night Jack wore her pink feather boa and purple heels with her to dinner. Thankfully Chad was not at all worried about him doing this. Because then he takes the feather boa and is throwing it around like it is a snake. Hope all is well in your neck of the woods!! And hope everyone is staying warm.